Learn more about individual projects at www.thinksalmon.com. The Nicola Watershed Community Roundtable identified ways to manage a limited water supply in the Nicola Valley. Watershed roundtables provide an opportunity for people from different communities, sectors and walks of life to have a say in the future of local watersheds. The City of Coquitlam, City of Port Coquitlam and Kwikwetlem First Nation formed the Coquitlam River Watershed Roundtable to coordinate and implement activities that reflect a common vision and shared values, and to promote the long-term sustainability of the watershed. Visit the Roundtable’s website for details. The Nicola Watershed Community Roundtable has worked for years on water issues in the Nicola Valley, and proposed a Nicola Water Use Management Plan. Read about it on the NWCRT website. The Xeni Gwet’in Chilko Roundtable initiated a dialogue on how to maintain, protect and enhance salmon stocks in the Xeni Gwet’in Caretaker area. FBC, the Pacific Salmon Foundation and Living Rivers Georgia Basin/Vancouver Island together launched the Collaborative Watershed Governance Initiative, promoting a high-level accord. Find out more. The Salmon River Watershed Roundtable has restored over 60% of the sites prioritized in their 1995 watershed plan and is now measuring effectiveness at the watershed scale. The Farmland-Riparian Interface Stewardship Program (FRISP) of the BC Cattlemen’s Association is a peer-to-peer service that helps agricultural producers protect waterways, prevent erosion and safeguard fish habitat. Over a five-year period, FRISP connected with 300 producers to help them make riparian improvements. This innovative program continues to support constructive dialogue and mediate conflicts between producers and regulators. The Bonaparte Watershed Stewardship Society has over a decade of service in restoration and stabilization of riverbanks and riparian areas — over 75 sites — some with funding from FSWP. Successes include critical Coho habitat restoration sites and new partnerships with landowners. The Salmon River Watershed Roundtable Society (SRWR) has restored over 300 habitat sites in the past 17 years, thanks to a high level of collaboration and cost-sharing by local landowners and other funders in the Salmon Arm region. This represents more than 60% of the restorations prioritized in their 1995 watershed plan, and SRWR is now measuring effectiveness at the watershed scale. For FBC, the accomplishment is special in another respect. 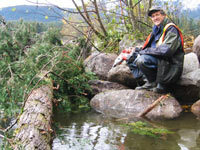 SRWR was a demonstration watershed of our predecessor Fraser Basin Management Board, back in 1993. Kudos to all who have served on the Roundtable over the years! Count on Salmon was a project that piloted fish wheels on the river for live capture and release of fish during stock assessments. FSWP has funded innovative approaches to in-season assessment of salmon abundance; strategies and technologies to reduce fisheries impacts on weak stocks and non-targeted species; research on the impacts of climate change on salmon; and coordination and collaboration among related initiatives and fisheries sectors. The Count on Salmon project evaluated different methods for in-season stock estimates. The results of this work were used by the Pacific Salmon Commission. The Upper Fraser Fisheries Conservation Alliance introduced Dual Frequency Identification Sonar (DIDSON) technology to estimate total escapement of Quesnel Lake Sockeye. This technology has also been used on the Fraser River since 2005. Chehalis First Nation undertook a project to investigate the traceability of stock from an inland fishery. Traceability is important to ensuring that fish are from designated runs and not endangered stocks, and for verifying sustainable practices. A Pacific Fisheries Monitoring and Compliance Panel was formed to promote fair, practical and effective monitoring and compliance for catch reporting across all salmon fisheries. Read more. 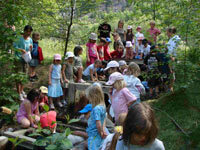 FSWP reached over 50,000 people through educational outreach and engaged 9,000 volunteers in watershed work. Langley Environmental Partners Society is a leader in innovative programs to engage citizens in stream stewardship and watershed health. With FSWP support, this included “Salmon Saturday” volunteer events, “Salmon in your Backyard” for residents, the “Salmon Chums” pledge and reward program for salmon-friendly actions, and “Salmon in Your School” to encourage youth to play their part. Stay current at www.leps.bc.ca. Cariboo Chilcotin Conservation Society offered a Water Wise outreach program, in partnership with the City of Williams Lake, to promote practical water conservation measures. Visit the CCCS website. Ready to learn more? See projects carried out in every region of the Fraser Basin. The Pacific Salmon Foundation and Fraser Basin Council worked together to launch "Salmon-Safe" in BC in 2011, a legacy of the Fraser Salmon and Watersheds Program. This certification program recognizes environmentally friendly management practices in agricultural, urban and rural settings to protect Pacific salmon habitat and water quality. In just two short years, over 40 BC farms, ranches and vineyards have been certified Salmon-Safe. 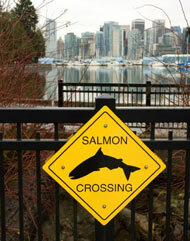 Now in 2013 the Salmon-Safe program will be extended to urban lands. Learn more. In the spring of 2013 the BC Legislature designated the seven species of Pacific salmon — Chinook, Coho, Chum, Sockeye and Pink as well as Steelhead and Cutthroat Trout — as an official BC emblem. The Fraser Basin Council, Pacific Salmon Foundation and BC Conservation Foundation applauded the move and the fact that all MLAs supported this amendment to the Provincial Symbols and Honours Act. Our three organizations had proposed the designation in 2011 as a way to emphasize the social, economic and environmental importance of wild Pacific salmon and healthy watersheds. Our report Do We Make it Official? Recognizing Pacific Salmon as a BC Emblem showed a high level of public support. A 2010 public opinon survey, conducted by Mustel Group, showed 93% of British Columbians named Pacific salmon as BC’s most iconic fish, and 85% supported a proposal to designate all seven species as a provincial emblem. Read about it.